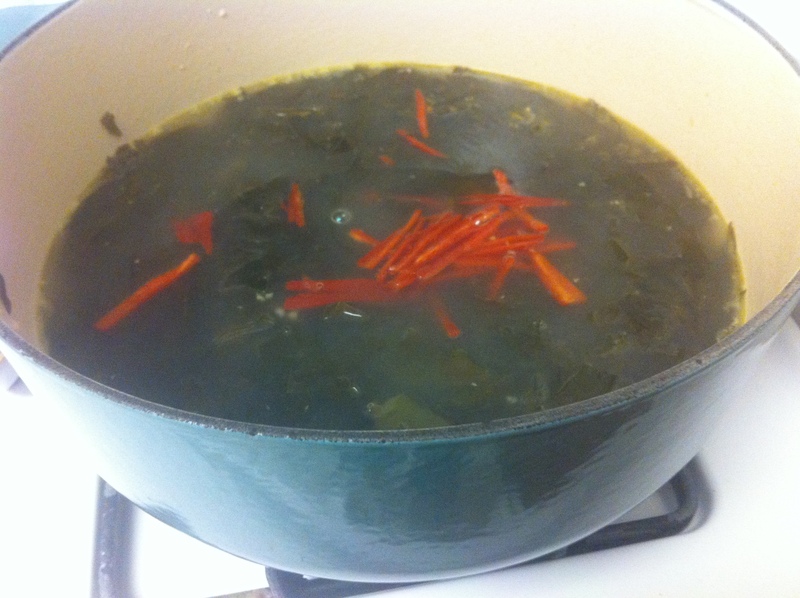 Miyuk-guk (미역국) is a hearty soup made of seaweed known as miyuk. 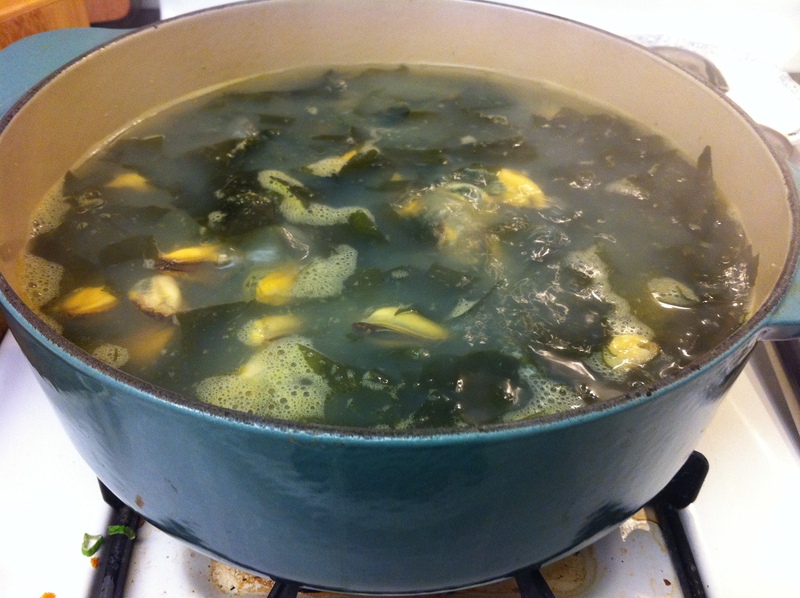 It is surprisingly a very versatile soup that is easy to make and full of nutrition. Miyuk-guk is usually made with beef, which I introduced a few weeks ago, but today, I decided to make it with mussels. 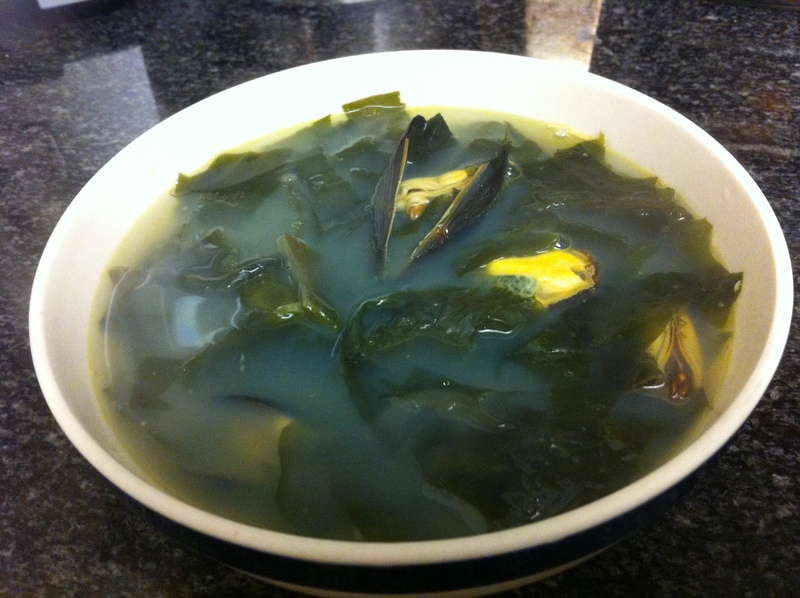 Traditionally miyuk-guk is given to new mothers right after giving birth because it has a lot of iodine. Iodine is good for breastfeeding and is said to help clean the blood. Furthermore, this custom also ties into the tradition that miyuk-guk is served on birthdays as a birthday soup. 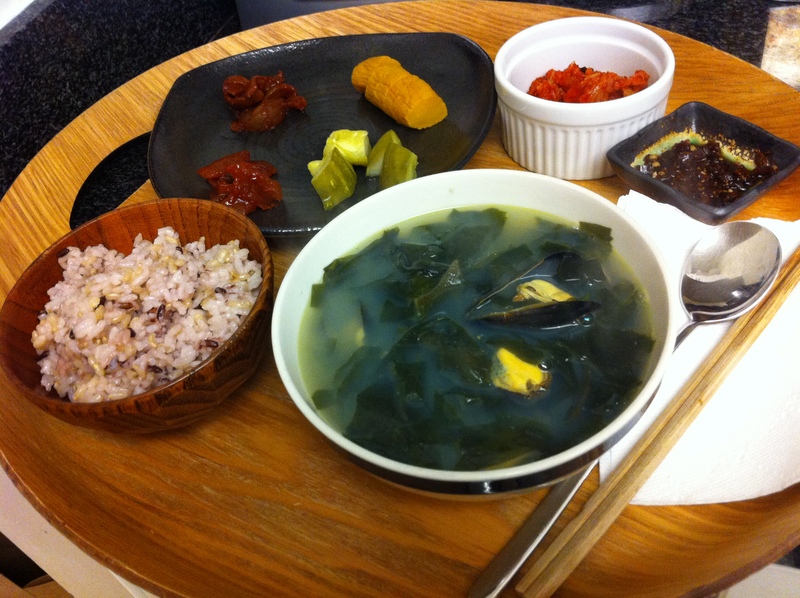 I will explain two ways to use mussels in miyuk-guk, one with fresh mussels and one with dried mussels. 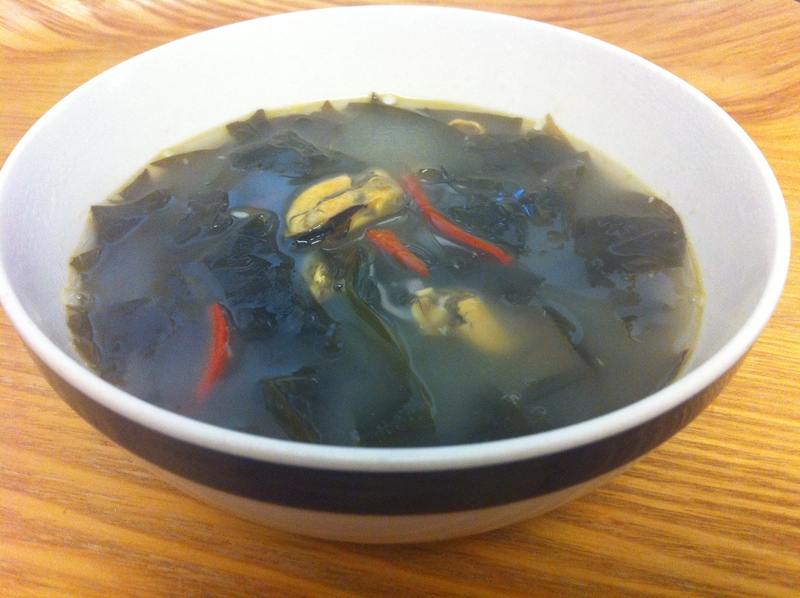 Additionally, you can also make miyuk-juk (미역죽, seaweed rice porridge) with the leftover soup. It is a quick and easy breakfast that I usually cook the next day. 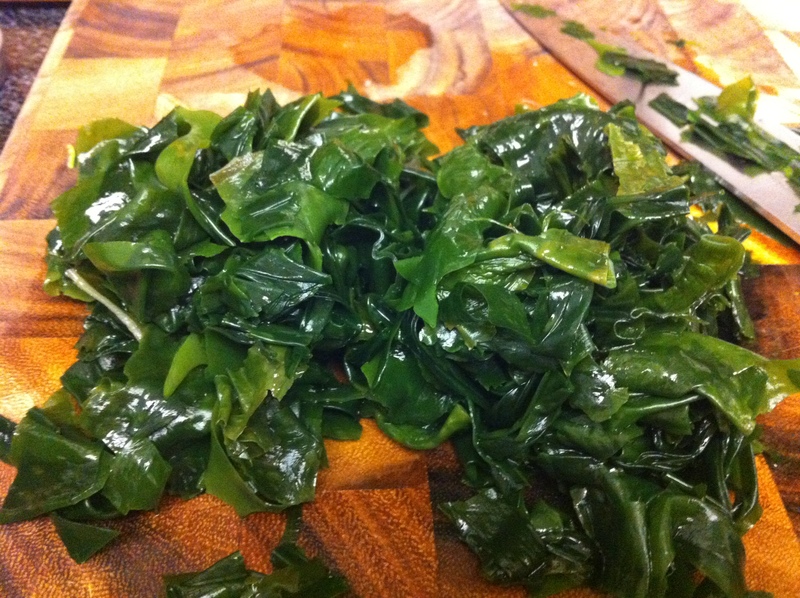 Soak about 20g of the dried miyuk in water for about 30 minutes until they are fully steeped. Cut the miyuk across about 1 1/2 inches (4 cm). If you are using fresh mussels, clean them thoroughly and boil them in about 8-10 cups of water. Cook them until all the mussels are open and skim off any form on top. Separate the broth and mussels. Strain the broth over a large bowel with a cheesecloth or coffee filter in a sieve to filter out any sand that might have been in the mussels. I use coffee filters when I don’t have cheesecloths by simply opening up the coffee filter in a singles sheet. 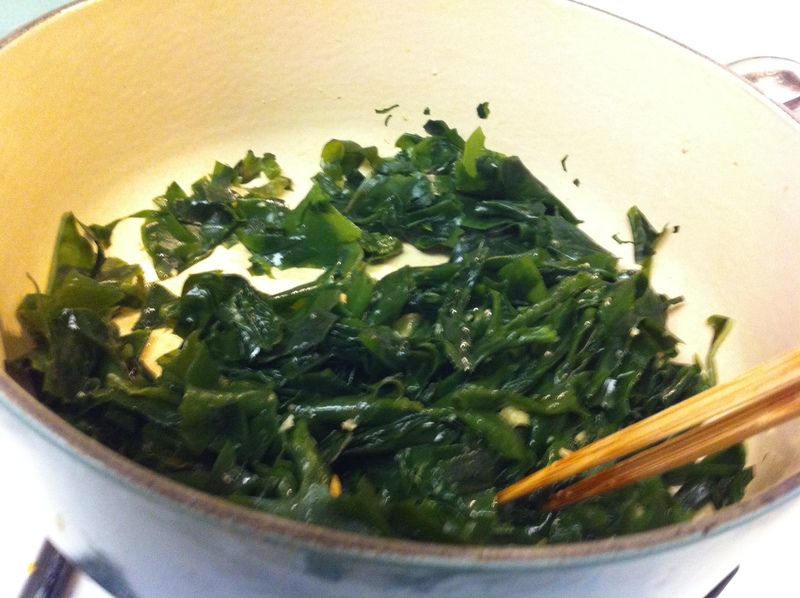 In a pot, drizzle the perilla or sesame oil and sauté the garlic, miyuk for about 4-5 minutes until the seaweed is coated with the oil and most of the moisture is gone. 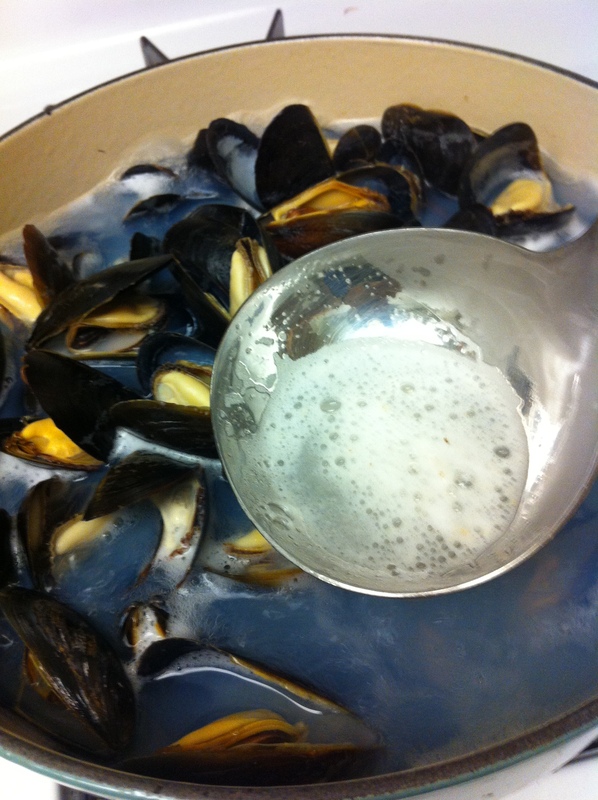 Pour in the filtered mussel broth and bring it up to a boil on high heat. When it comes to a boil, lower the heat to medium heat. In the meantime, separate the mussels and shells. I left a few shells intact for garnish. After the soup has been boiling for about 10 minutes, add the mussels and cook for about another 5 minutes. Taste and season with gukganjang or soy sauce. You can additionally use fish sauce for more flavor. Your family and guests can individually add more salt if needed. Add the chilies if you want a slight kick, and add a pinch a black pepper. 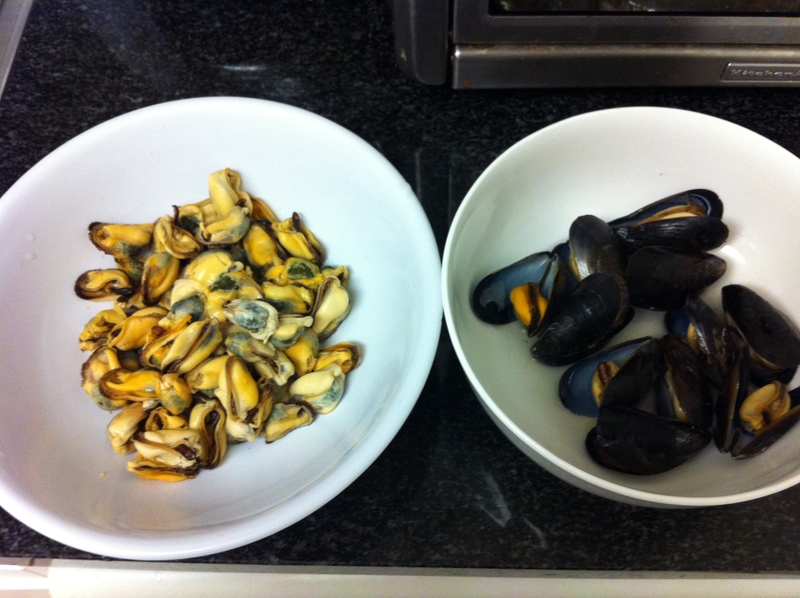 Rinse the dried mussels in cold water and place them in warm water for about 1 hour. 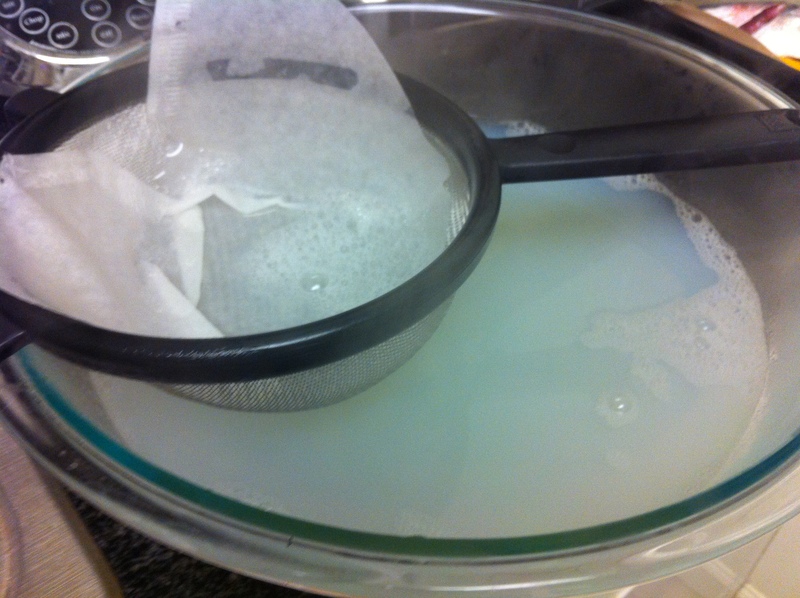 Soak about 20g of the dried miyuk in water for about 30 minutes until it is fully steeped. Cut the miyuk across about 1 1/2 inches (4 cm). 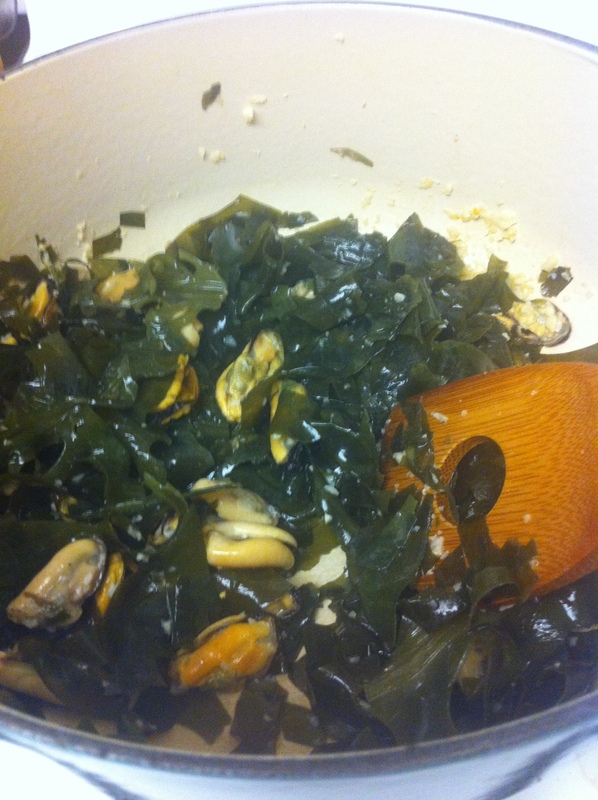 In a pot, drizzle the perilla or sesame oil and sauté the garlic, miyuk and mussels for about 4-5 minutes until the seaweed is coated with the oil and most of the moisture is gone. Pour in about 6-8 cups of water and bring it to a boil on high heat. Once it starts boiling, lower the heat to medium and cook it for about 30 minutes. This entry was posted in Good for breakfast, Good for dinner, Good for lunch, Rice Dish, Seafood, Soup/Stew (국/탕/찌게) and tagged Juk, Miyuk, Mussels, Porridge, Seaweed by gangnamkitchen. Bookmark the permalink.